One Red Paperclip is FUNNY! This guy is using the barter system to trade a paperclip for a house. (With a gazillion trades in betweeen.) He’s already up to a year’s rent in Phoenix. I’m amazed by his crazy idea. Not only might it actually work, but he is creating an amazing and fun experience for himself. Very cool. My name is Kyle MacDonald and I am making a series of up-trades for bigger or better things up to my goal of a house. 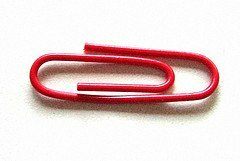 I started with one red paperclip on July 12th, 2005. You can read stories about each trade by clicking on the pictures to the left. I’d suggest starting here. I will travel ANYWHERE for the right offer – including Yahk, British Columbia, Canada. Motivational keynote speaker, Enjoyer of Goofy People, Fan of Barter! Technorati Tags: Barter, Motivational Speakers, Humor, One Red Paperclip. https://www.bradmontgomery.com/wp-content/uploads/2018/11/logo-1-495x198-1-300x120.png 0 0 admin https://www.bradmontgomery.com/wp-content/uploads/2018/11/logo-1-495x198-1-300x120.png admin2006-04-22 10:47:532006-04-22 10:47:53One Red Paperclip is FUNNY! Speakers need a BackGround Check! Carnival of Kid Comedy? You bet!